The buzz of anticipation was audible in the Brower Center theater awaiting the start of the evening’s program – Sea Change: From Plastic Straws to Local Laws on Wednesday, March 20. The presenters did not disappoint, in fact, the crowd erupted in a standing ovation for the first presenters, ten year olds Sam (Domingo) and Fiona (Groth Reidy). 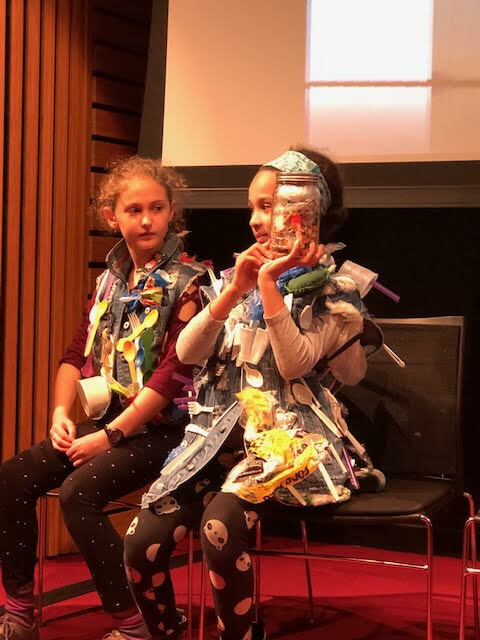 Students of Jacqueline Omania’s Zero Waste classroom at Berkeley’s Oxford School, their inspiring presentation chronicled the students involvement in passage of Berkeley’s groundbreaking Single Use Plastic and Waste Reduction Ordinance. 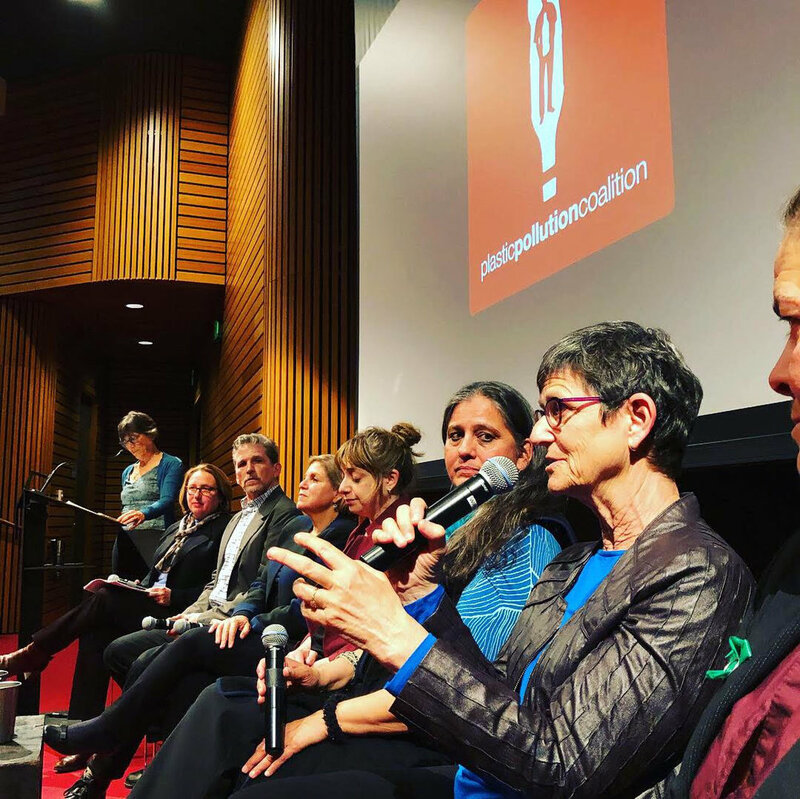 The program featured some of the most passionate and persistent activists responsible for the strategy, language, surveying and implementation of Berkeley’s innovative ordinance, as well as those involved in the plastic pollution movement from gateway and global issues to health impacts. The evening reflected the collective efforts of a grassroots movement begun almost ten years ago to stop plastic pollution. It focuses on a system wide shift from disposable to reusables. The current disposable one is not only unsustainable, but unhealthy. 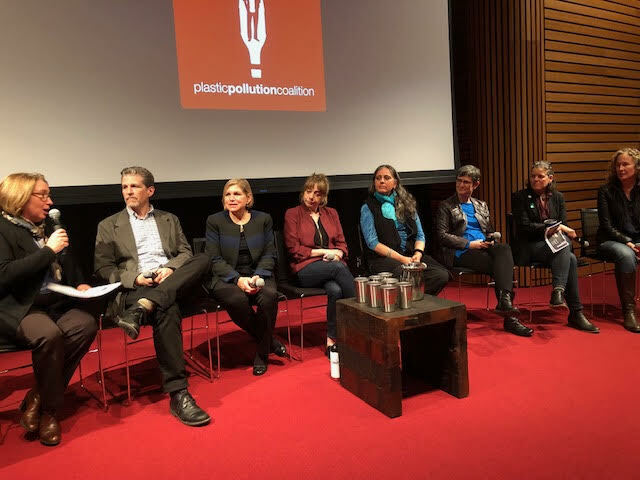 Dianna Cohen, Co-Founder and CEO of Plastic Pollution Coalition, introduced Open Your Eyes, a short video laying the foundation for the global problem of plastic pollution, followed by Jackie Nunez, founder of The Last Plastic Straw, who introduced the Straws film. Labelling plastic straws as the “gateway issue” into plastic pollution, Jackie has been credited with sparking a global movement towards action to eliminate single-use plastic straws. 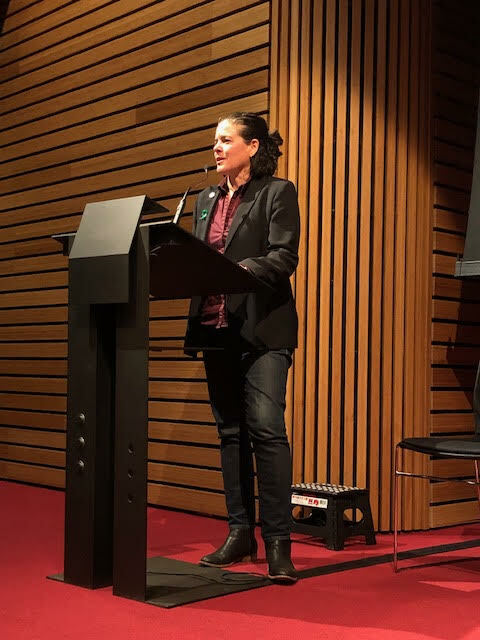 Council Member Sophie Hahn (Berkeley City Council Member, District 5) who co-authored introduced and shepherded the ordinance. She provided a brief background on why it was important to sponsor the ordinance and the specific elements included. Martin Bourque (ED, Ecology Center), Berkeley’s local champion for all things waste related and in particular, this ordinance. He gave the local history of how the ordinance evolved. Miriam Gordon (Upstream Policy Director) – a passionate leader and policy wonk on source reduction for much of her career. Working mostly out of the limelight, she focused on crafting strategy and writing the ordinance language. Samantha Sommer (Waste Prevention Program Manager, ReThink Disposable) – turned the idea for reduction into quantifiable data and demonstrable financial savings for businesses. Her team surveyed businesses and customers, collecting valuable opinion data on elements of an ordinance that would have support. Jacqueline Omania (Green Educator Leadership award, Oxford Elementary School), a passionate third grade teacher who has been running a Zero Waste classroom for five years, inspiring students like Sam and Fiona. She took issue with who inspires whom, insisting that the students inspire her. Dr. Barbara Cohn (ED Child Health and Development Studies) – Berkeley epidemiologist doing seminal research on the effects of toxic chemical exposure across generations and co-principal investigator with Dr. Sandra Curtis (PPC) on ReThink Plastic. She acknowledged how positive the impacts of the foodware ordinance will be on upcoming generations, reducing the health impacts from the chemicals in plastic in such diseases as cancer, diabetes, obesity, and infertility. The audience engaged in a Q&A with the panelists, including Dianna Cohen and Jackie Nunez. The panelists engaged in Q&A among themselves. Guests circulated with the panelists, continuing more in-depth conversation while enjoying light desserts and drinks. “Live Plastic Free” stainless steel cups were generously provided by John Borg of Steelys Drinkware. Notable PPC member Wavy Gravy attended, as did a number of the PPC’s fiscal sponsor, the Earth Island Institute. The David Brower Center generously co-hosted the event. Plastic Pollution Coalition’s video Open Your Eyes, narrated by Jeff Bridges. STRAWS film trailer - For showing the STRAWS film with speaker Jackie Nunez, please email her at jackie@plasticpollutioncoalition.org. Berkeley’s Ecology Center. - A great resource to help you start living plastic free. And for a fun fact, listen to Pete Seeger’s If It Can’t Be Reduced, ©2008 Pete Seeger and Martin Bourque – the lyrics are just as relevant today as it was when written. For help crafting an ordinance for your town modeled on Berkeley’s, contact Council Member Sophie Hahn here. The work of many Coalition members has come to fruition this week with the BETA launch of the Global Legislative Toolkit for Plastic Pollution Reduction. Be among the first to explore and give feedback the toolkit, an online web-portal for policymakers and advocates to advance policies that reduce plastic pollution. The toolkit is the next step in working toward source reduction for plastic pollution globally.